The Department of Health and Human Services is considering whether it will force former Secretary Tom Price to repay more than $300,000 a government watchdog says was wasted on chartered flights. President Donald Trump’s first HHS secretary wasted at least $341,000 in taxpayer funds to charter flights for himself and others around the world, the inspector general (IG) for the department determined in a report released Friday. “Our rigorous review of former HHS Secretary Price’s use of chartered, military, and commercial aircraft found that 20 out of 21 trips did not comply with applicable Federal regulations and HHS policies and procedures, resulting in waste of at least $341,000 in Federal funds,” IG spokeswoman Tesia Williams said in a statement shared with The Daily Caller News Foundation. The IG recommends the new head of HHS Alex Azar “determine appropriate actions to recoup the travel costs,” Williams said. HHS, however, was not convinced that clawing back the money spent by its former chief is viable. “It is unclear as a matter of law whether recoupment in this setting is legally appropriate,” HHS said in its response to the IG, adding that the waste detailed in the report “is a matter worthy of further review and study by our Office of the General Counsel.” A spokeswoman for HHS said it will ask the Office of General Counsel to review whether there is a legal basis to seek recoupment. Price was forced to resign his position Sept. 29, 2017, after months of reports, particularly from Politico, detailing seats on chartered private jets that he purchased for himself, staff and family members at the taxpayers’ expense. “Of the 21 trips related to former Secretary Price’s travel, we determined that for one trip all applicable Federal requirements had been followed,” according to the IG’s report. Price was meant to secure approval for booking all his flights, but failed to do so on numerous occasions, which got him into trouble. The IG found that $341,000 worth of Price’s travel was wasteful, and the $59,390 check that Price delivered to the Department of the Treasury earlier in 2018 does not account for a total recoupment of the government’s costs. The amount Price repaid includes $7,503 incurred when Price’s wife accompanied him to Asia, Europe and Liberia, and $51,887 for Price’s seat on chartered flights. But the IG said Price wasted far more than $51,887 on the flights. For the 12 trips Price used chartered flights, his office never even considered a commercial option for the secretary’s travel, the IG said. “In no instance was the cost of the chartered aircraft less than the cost of the commercial aircraft,” the IG said. 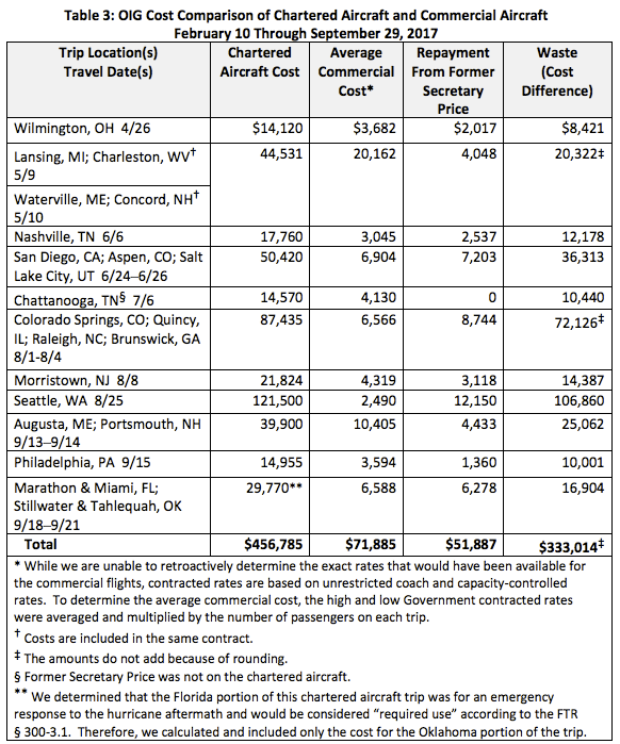 While it is difficult to determine whether there would have been a seat on a flight a year later, the IG estimates the cost of chartering the flights was $333,014 more than the average commercial option. For three of the flights, the IG found Price’s office did not choose the least expensive chartered flight option, and did not note in contract files why the more expensive option was selected. For one of those flights, from Seattle, Washington, to Washington, D.C., on Aug. 26, the lowest available option was $75,829, but Price’s office selected the $121,500, a difference of $45,671. “We determined this cost difference was extravagant, careless, or needless and thus considered it waste,” the IG wrote. The IG further urged the government to recoup $4,926 for travel that started or ended in locations other than the official duty station, requiring additional government travel arrangements, and $2,960 for excess lodging and car rental costs.